Do you have a dog that is wonderful in the home but who turns into a growling, barking, lunging, whirling dervish when he goes out for a walk? Do you pick up his lead with trepidation and head out of the house at the crack of dawn or do you wait till it’s dark so you don’t meet anyone else with a dog (fingers crossed)? You set out and, horror of horrors, you see a dog and their owner heading towards you. You cross the road but you already know what is going to happen. Your dog spots the other dog; his ears go up, his tail stiffens, and then he lunges, barks, spins while you struggle to hold on to him. The other owner gives your dog a dirty look and may even suggest you ‘get control of your dog’. Sadly, this is a common occurrence for many dog owners. But take heart, you can help your dog and start to enjoy your walks with him again. Flight vs Fight: Dogs that behave in this way are called ‘reactive dogs’. They are not nasty or aggressive. Most of the time they are afraid, but because the lead restrains them, they cannot flee – so they ‘fight’ instead. They have learned that by behaving in this way the frightening object – be it an unknown human, dog, vehicles etc. – goes away. So, it is a strategy that works, and dogs do what works for them. Dog-reactive-dogs are usually not comfortable off lead although they may appear so. Studying your dog’s body language will reveal signs of discomfort. He appears comfortable as he can usually get away if he needs too. Social Skills: Another reason dogs react is frustration. They really do want to greet everyone they see. Poor social skills and a lack of manners are the main reasons for a dog to behave in this way. 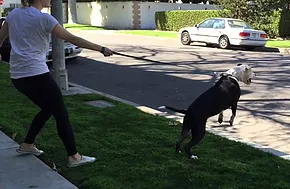 The lead acts as a barrier preventing him from doing what he wants, and this, combined with a lack of impulse control leaves him unable to deal with rising frustration and so he barks, and lunges towards the other dog or person. So, what do you do about it? And you must do something, otherwise your dog’s behaviour will get worse. Dogs behave this way because that behaviour works for them and they will practice it repeatedly, until it has become a habit – ‘it’s what I do when I see another dog’. Let’s go! The first thing you need to do is to relax. If you are bundle of nerves it is not surprising that your dog gets worried. Don’t hold his lead tight* – let him have the slack. When you see another dog approaching – breathe out, soften your hands on the lead, say a jolly ‘let’s go’ to your dog as you turn 1800 (i.e. do a U-turn) and walk in the opposite direction. If you can, do this before your dog has had a chance to react. Stop Pulling: Teach your dog not to pull. To do this you need to stop pulling too! Practice this exercise in the house, then the garden – it will take time if your dog has pulled all his life – but with consistency and perseverance you will both learn. Have your dog on a lead at least 6-8 feet long. Stand still and your dog go to the end of the lead. Do NOT allow your hand to leave your hip – tuck it in a pocket if necessary. Wait until your dog puts the tiniest slack in the lead, as soon as you feel that, call your dog, and reward him with a favourite treat. The key is not to let your arm leave your side. Become an expert in reading your dog’s body language: You need to be able to read your dog’s body language so you can recognise when he is beginning to feel anxious or aroused. This is what is called his ‘reactivity threshold’. Once your dog is over this threshold he is in full reactive mode. You need to learn to pre-empt this and do something to distract your dog and keep his focus on you. Displacement behaviours like suddenly scratching.